Hey, everyone! Today I'm diving in to the Gina K Designs Glitz Glitter Gel to create a super shimmery night background for the super cute images from the Witch Sisters stamp set from Kindred Stamps! I wanted my background to be dark and spooky - but in a good way! I started by creating a watercolor background with Storm Cloud Nuvo Shimmer Powder. I dried it with my heat tool until it was completely dry. Then I used the new Pixie Spray from Therm O Web and sprayed the back of the Moon & Stars stencil from Kindred Stamps and pressed it onto my watercolor background. This stencil is fairly detailed, so you'll want to make sure that it has good contact with the cardstock. Then I spread on some Gina K Designs Gold Glitz Glitter Gel. THIS STUFF IS AMAZING!! Everyone talked about how glittery it is ... but seriously words cannot do this product justice! It's just clear gel and ALL of the color comes from the glitter! Absolutely gorgeous! 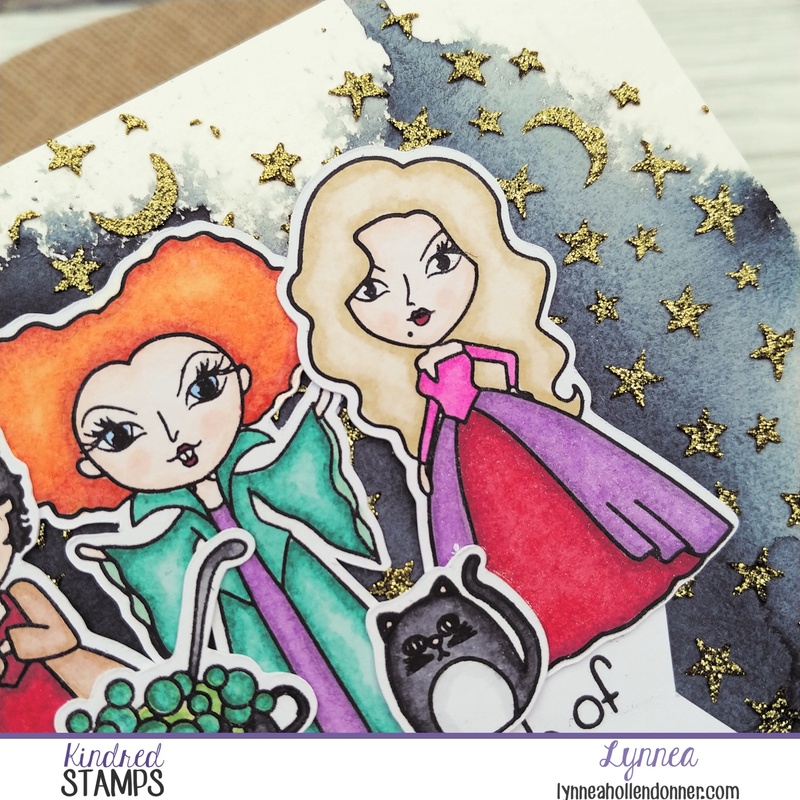 I stamped my images from the Witch Sisters stamp set onto heavyweight cardstock and colored them with my alcohol markers. I used mainly my Spectrum Noir Triblend markers, but I did mix in some Copic markers for my grays and blacks. I also stamped a sentiment onto a strip of cardstock and trimmed the edges into banners. I adhered my images onto my super shimmery background. You want to use a super strong liquid adhesive to make sure everything sticks well. The Glitz gel is quite textured and it is raised, so you need an adhesive that will bond well. I used my favorite liquid adhesive - iCraft Ultra Bond! It holds super tight and dries quickly! Check out my video below!